There's more to life than just academia! 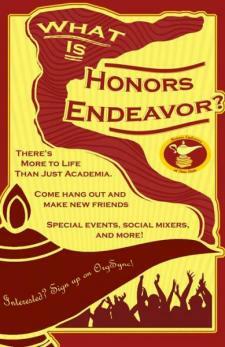 Honors Endeavor is an organization that is built on learning, enrichment, and building lasting relationships while supporting the Honors Program. Any student is welcome to join! New Officer Elections Coming Soon! "Attack of the Nerds" Fright Night Oct 27th"